Purple neutralizes yellow tones in hair, keeping bleached or silver tresses cool and bright. Toning purple shampoos are available at the beauty supply store for this purpose, but you can also make a DIY version with food coloring. Start with a full bottle of moisturizing shampoo that contains no dyes (so it's easier to see how purple you're making it). Close the shampoo bottle and shake it vigorously to mix the purple food coloring well. The shampoo should only be lightly tinted with purple. If you cannot see any purple hue, add 1 drop at a time until the color is visible. 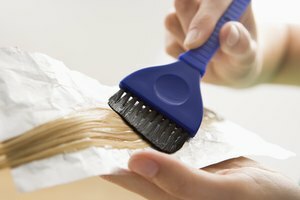 Shampoo your hair immediately after bleaching. Use the purple shampoo every day in between salon visits. If you start noticing a purplish cast to your hair, use the shampoo every other day, or only once a week. The longer you leave the shampoo in your hair, the more color will deposit onto your locks, so don't leave it in too long. Making homemade purple shampoo is a trial-and-error process; you may have to add more drops to get the desired results. Make any adjustments needed until the shampoo deposits enough purple onto your hair to neutralize the yellow tones.